Camry Hybrid knows the perfect balance of fuel efficiency and power. Thanks to Toyota's Hybrid Synergy Drive technology, both the gas and electric motors combine to put out an impressive 200 hp. Turbulent air increases drag to your vehicle, which also adds wind noise and reduces the efficiency of your Hybrid vehicle. Camry Hybrid features small, specially placed design features called vortex generators to help smooth things out. Not only do these help Camry maximize its efficiency, they help keep things quiet inside the cabin too. The 2017 Camry Hybrid comes equipped with an aggressive, sporty looking grille that comes available on the Camry SE Hybrid. Just one of the ways your hybrid can stand out from the rest. Camry Hyrbid uses various smart technologies to make certain your drive is as efficient as possible. The Hybrid LE offers up to 42 MPG city, while the trendy Camry Hybrid SE offers up to 40 MPG city. Toyota knows how to optimize their hybrids for the best performance possible without sacrificing fuel economy. Brighter light. More style. Camry Hybrid's available LED headlights help light up the road, and the black sport trim bezels surrounding Camry Hybrid's LED headlights add the right amount of attitude. 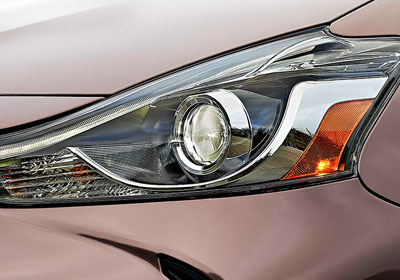 And when the sun isn't shining, available LED Daytime Running Lights (DRL) help ensure you can't be missed. 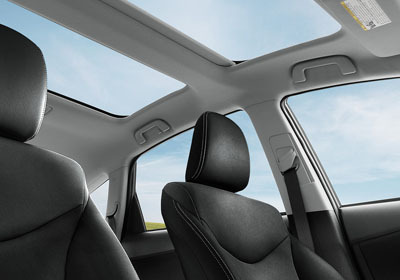 Whether it's the sun, moonlit sky or a gentle breeze, Camry Hybrid's available power tilt/slide moonroof lets you take it all in. No wires means no problem thanks to the available wireless charging system that lets you simply place your device onto the nonslip surface to begin charging safely and conveniently. Camry Hybrid has plenty of room thanks to the help of sculpted cutaways in the seats and interior panels, which help provide more knee and leg room for passengers either up front or in the back. Furthermore, the headliner was designed for larger head room throughout the whole cabin. Get where you need to go with ease. Powered by HD Radio™, Camry Hyrbid’s available traffic-monitoring feature provides real-time information on the traffic flow in your area. The available Entune™ Premium Audio with Integrated Navigation system can even help predict traffic or suggest quicker, alternate routes. With Camry Hybrid's available Entune® App Suite, you can access Pandora®, Slacker Radio and iHeartRadio for your music cravings. Make reservations at your favorite restaurant with the OpenTable® App and purchase movie tickets ahead of time with MovieTicekts.com. Plus, get sports scores, stocks, traffic and weather updates - even fuel prices. Camry Hybrid's standard 8-way power-adjustable driver's seat with power lumbar support helps you find your perfect driving position. And when the weather gets chilly, available heated front seats will help you stay warm and confortable. It's comfort tailored to you. High Style. Intuitive control. Camry Hybrid's center stack makes it easy to access features like multimedia systems, available integrated navigation and available Entune App Suite. And the available dual zone automatic climate control helps give you and your front-seat passenger custom levels of comfort. All Camry audio systems include a standard backup camera. Any time you put your Camry Hybrid in Reverse, an image of what’s visible to the camera will appear on the touch-screen display. The new Camry Hyrbid comes with an available safety feature called Dynamic Radar Cruise Control, which automatically adjusts the vehicle's speed to assist in maintaining a preset following distance between you and the vehicle in front of you. The all new Camry Hybrid comes with a very useful tool in the Energy Monitor. The monitor displays the gas engine, the electric motor generator, and the hybrid battery to determine real-time information showing how power is being displaced to the wheels or how the battery is being charged. The all new Toyota Camry Hybrid utilizes advanced tire technology to increase inflation pressure, resulting in reducing tire rolling resistance and improving fuel efficiency.